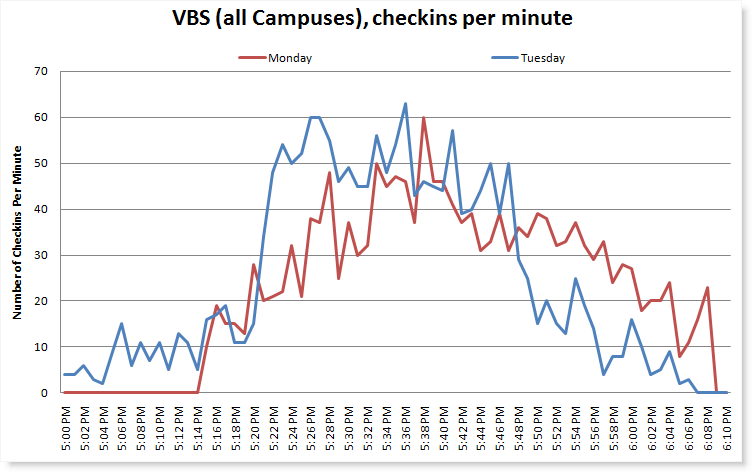 This year we had a little more than 1750+ kids use the automated check-in system for VBS across three of our campuses. 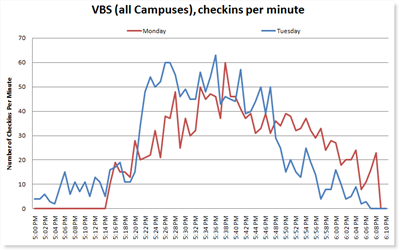 Looking at this graph which shows the number of check-ins per minute, you can see check-in does not ramp up as sharply as we would want on Monday (red). By Tuesday (blue) after some adjustments were made and parents knew the routine a bit better, check-in ramps up quicker to about 50-60 kids per minute and 28 minutes later the lines were gone and the majority of kids were checked in. It's OK, but not great. Ideally, you'd like to check in 1500+ kids per minute and have check in last one minute. Not realistic or necessary since not all parents arrive exactly on time. Perhaps 150 kids per minute is a goal. Then check-in only lasts 10 minutes. What will it take to reach that goal? With some analysis, we found that it takes about 15-18 seconds per parent to check in their kids. It turns out, much of the time it takes for someone to check in using our system involves punching in the phone number (see this video). That's something I already knew, and it's one of the reasons why I wanted to keep barcode scanners at all our campuses. (a battle I lost -- for now). If a parent uses a barcode they shave 6-12 seconds off that time (depending on how slowly a person normally types in their phone number) and they can check in their kids in about 4-6 seconds.